With its well rounded product offering and top notch customer service, Merrill Edge is a win for the discerning investor especially clients who are under the Bank of America’s Preferred Rewards program. Established in 2010, Merrill Edge is one of the subsidiaries of Merrill Lynch, an international investment division of the Bank of America. The brand is well known in the financial industry and is considered a household name since it was founded in 2014. Despite the fact that Merrill Edge was only set up in 2010, the brokerage division has already earned a reputation of being a customer oriented broker with its excellent customer service. The broker’s services are open to anyone but Bank of America clients’ do get to receive preferential treatment under the Bank of America’s Preferred Rewards program. Additional benefits which clients get to enjoy under the Preferred Rewards program include integrated account management, seamless funds transfer and universal logins. The preferred reward program also entitles clients to qualify for free trades. Clients under the preferred reward programs can link their Merrill Lynch’s account to their Bank of America account. Under the preferred reward program, clients can enjoy up to 100 free trades per month. Merrill Edge “Stock Story” provides a concise insight into individual stocks. The MarketPro platform is only able to perform a few basic order types. With its links to the Bank of America, Merrill Edge is a natural choice of Bank of America’s customers. 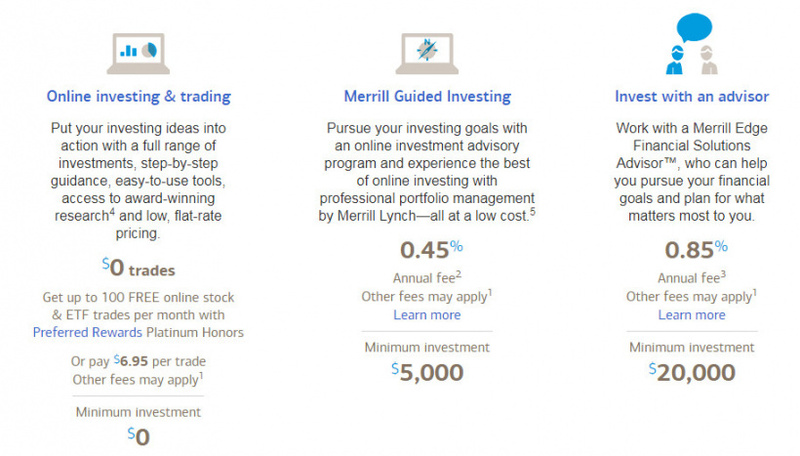 ETF and stock trades at Merrill Edge are charge a flat fee of $6.95 per trade. While slightly higher than what its closest competitor charges, the fees at Merrill Edge certainly do offer value for large volume trades. At the same time, Merrily Edge does not charge its clients any inactivity fees. For new customers, they can request for the 300 free ETFs and stock trades offer valid for 3 months. The promo offer is not openly advertised so a request through the phone is required to avail of the promo offer. In addition, if you are an existing Bank of America client, you are also entitled to up 100 free trades per month under the Bank of America Preferred reward program. Platinum account status holder get to receive 30 free trades per month while Platinum Honors Status accounts are entitled to 100 free trades per month. The mainstay of Merrill Edge’s trading platform is the MarketPro trading platform. The platform is actually based on the eSignal’s platform. The platform is web based and Java 1.5 or higher is required to power it. However, the platform is only accessible when a minimum trade quota of 15 trades is achieved. Alternatively, a client must have a total value of $50,000 in assets in his account. Overall, the MarketPro trading platform comes with a decent set of features. It is able to support third party tools such as OptionsPlay and Recognia. OptionsPlay is an options education and trading analytics tool while Recognia is the industry leader in Technical, Fundamental and Value-Based Analytics. The trading platform also comes with a pretty decent charting package. You have access to more twenty different types of drawing tools and a total of 73 types of technical indicators. For mobile traders, Merrill Edge supports both iOS and Android powered devices. The mobile trading app feature a user friendly interface and supports touch ID login, watch lists and real time quotes. You are also able to view interactive charts as well as heatmaps. 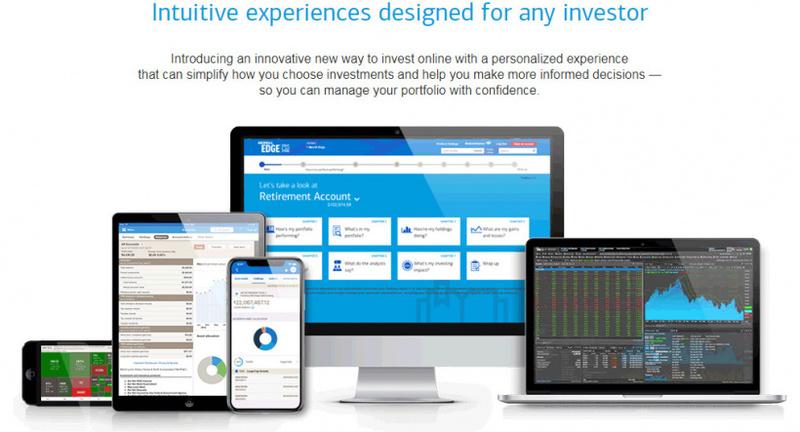 With its customized dashboard, traders will be able to trade stocks, ETFs, Mutual Funds and Options directly from their smartphones. There are several ways which you can fund or withdraw from your Merrill Edge account. For bank of America’s clients, the seamless connection of accounts offers instant transfer of funds. Alternatively, you can also use bank wire transfer to wire funds electronically from another bank or financial institution. Apart from wire transfer, it is also possible to fund your account with a check. Finally, Merrill Edge also support transfer from another brokerage account, securities or IRA account from another broker. Customer support at Merrill Edge is available 24 hours a day, 7 days a week. Clients can access the support team by calling them on the toll free number provided on the website. In addition, you can also email them directly. Apart the support provided by the customer support representatives, Merrill Edge also supports its customers through a detailed FAQ, education and resource section. As part of the world’s leading financial institution, security and the protection of clients’ personal information is a high priority at Merrill Edge. The broker has adopted several layers of security measures in order to protect its clients. Some of the measures adopted by the broker include regular testing and event participation to test the readiness of the broker’s cyber security network to deal with cyber threats. Independent third parties are also engaged to review the robustness of the security system. The broker also maintains close cooperation with government agencies and industry players to continuously improve on measures to defend against cyber threats. Overall, there is no denying that Merrill Edge is able to offer investors a well rounded offering. The broker can certainly boast of a top notch customer service and it has been recognized by leading industry reviewers such as J.D Power for the provision of “An Outstanding Customer Service Experience” for 8 years straight. And for Bank of America’s clients, they will certainly find Merrill Edge a perfect fit for their investment needs under the Bank’s Preferred Rewards program.